The irony here is I have no good opening for this post. I’ve been thinking about this one for a couple of days and realized a few things. One is that outside of screenplays, where the first ten pages are of vital importance, the writers I hang out with and I haven’t talked much about the process of crafting our openings. Close on that was the realization that I don’t really have a full grasp of my process for openings. So bear with me if this is less how-to and more theory but I do have some thoughts and tips. First of all, don’t worry about it, at least at first. If you come up with a killer first line that’s great. Even better if it flows seamlessly into an eyeball bursting opening. That will probably come later though after your first draft is complete. It’s hard enough to get started on a new piece without the added pressure of a strong opening. If I stare at the screen for more than a few seconds I just start with stage direction. That’s also usually the weakest opening so you’re probably going to change it. I went through a bunch of my old stuff (just the first few lines) and found this gem–“The black Jag slid smoothly into the parking space marked Caleb Sinclair.” Blech. The rest of the paragraph (keep in mind this is the first paragraph) is all Caleb getting out of his car. It’s a short little story from one of our word exercises and it’s actually pretty decent. But that opening would be the first to get the cleaver. So that’s another goal. Try to create more questions than you answer. Think of your opening like a movie trailer. You have to set the tone and give just enough away that they want the rest. Give too much away and they think there’s no reason to keep reading, they have it figured out already. If it helps think of your reader as unwilling to go on and you have to trick him. And finally a genuine how-to tip. Going over some old stuff showed me a bunch of weak first draft openings. Some of the second draft ones could be a little stronger too. But I did notice one technique crop up rather frequently that always seemed to work well. A single line of unattributed dialog. It doesn’t seem to matter what’s being said because you automatically wonder who said it and what the heck they’re talking about. Pow! Instant engagement and they’re hooked for at least the next line or two. Make ’em count. Dialogue tags. Or Snags. I took the long route when it comes to tagging dialogue. Under the mistaken belief that the snappier, more interesting and unusual my tags, the better dialogue, ergo the better story I’d create. After attending a couple of workshops, to my horror, I learned that the list of fifty plus creative ways of expressing ‘he said, she says’ I’d purposefully, specifically and methodically accumulated were off base and actually operated as snags to my prose. For the reader, ‘said’ slips in, rolls over and then disappears. Whereas shout, snort, sniff, yell, call, cry, croon, coo, hiss, demand, snap, snipe, reply, respond, exclaim, proclaim, groan, moan, protest, grunt, whine, mumble, grumble, murmur, mutter, utter and all the other cute tags I’d compiled were more often than not operating as story trip lines, stopping the flow and forcing an emotion on the reader. No doubt it can be difficult to express the intended tone in dialogue with only ‘said’. After all when speaking it’s how we say something that imparts the emotion beneath the words. That’s why it’s so tempting to use a tag. But if something else is needed, then add an action with the words, like a visual body language. Instead of ‘he sniveled’, have the corner of his mouth curl up or his nose twitch as though smelling something unpleasant. Another method is to use the next line of dialogue to show the reaction to the tone. Instead of ‘she shouted’, the next line could say it all – “You don’t have to yell”. Tags become a trap because they tell the reader how to feel instead of showing. The emotions in dialogue are best conveyed by the words inside the quotation marks and the actions surrounding them, not the tag. In a rather embarrassing situation that I cannot entirely explain, I am a huge fan of the TV show Glee. It’s a ridiculous show about the members of the school Glee Club and their lives in the social sub-basement of High School. They work their way through the traditional misfit hallways that almost all of us walked, but break into song far more often than I ever did. These songs are covers of everything from classic rock to current pop, and they are just endlessly inventive. The cast has a wicked set of pipes on them, and in a few cases have cranked out a cover I like better than the original. Heresy. The stories are silly and often horribly contrived, but other than music the thing doing the heavy lifting on this show are the insane characters. Nearly every one of them starts as a cliche, then dials it up just one notch into the absurd to make a thing of beauty. Sue Sylvester is the high-school cheerleader coach (the Cheerios), with an obsession for personal glory and destruction of the Glee Club, and a conviction that disabled access ramps at the school encourages laziness. Emma Pillsbury is the school guidance counselor, with a fear of germs and an agreement to marry a man if she never has to touch or live with him. Kurt Hummel is a gay fashionista who took a Slushee facial for a friend, and a great football kicker when he can warm up to Beyonce. They’re all brilliant, and I’m endlessly fascinated by the way they are written and the energy the actors bring to the roles. It looks to me like they’re having a hell of a lot of fun. My body is like a rum chocolate souffle. If I don’t warm it up right, it doesn’t rise. Writing extreme or challenging characters is one of my biggest struggles. I can make up some crazy stuff, but then often have difficulty working it into the story. Or I fear I’ve gone too far (or added in something pointless) that will annoy the reader so I back off and they become more vanilla. I know full well that having a strong character with a specific Point of View, quirks, perspectives, and oddities is the fuel of great stories, and great dialogue, but it is far easier to say than do. So I’ll keep working on it, and in the meantime keep watching Glee for inspiration. …provide what exactly? The understanding that money is the most important thing – or the idea that the only life worth living is one that you’re really passionate about? At a loss for words? There’s help for that. 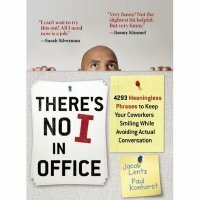 I recently read an insightfully funny book, “There’s No I in Office”, a compendium of 4,293 phrases to use in conversations with your co-workers. Television writers Jacob Lentz and Paul Koehorst recognized the need for a guidebook to help cubicle denizens navigate the risky waters of office small-talk, where avoidance will likely get you labeled as anti-social and saying the wrong thing to the wrong person at the wrong time may earn you an even worse title: anti-employed! As a writer, I recognized another good use for the book: dialogue starter ideas. Do you have a lumberjack character? The book has a page of witticisms like “I love these plaid shirts” that are sure to get you thinking of other dialogue to build around it. Got a character that’s a U.N. translator? An entire scene could be crafted from a starter phrase like “What’s your favorite foreign swear word?” The list of professions for which the authors have drafted entries is itself a gold mine of ideas. Need to flesh out a character with an interesting career choice in their past? I can just about guarantee you’ll find a gem or two. A woman in my screenwriting class has a script about a fairly famous historical romance, and has struggled a bit. There are several interesting scenes between the two main characters, but as we read through what seemed like the defining scene between the pair, something was missing. I noodled on it a bit, and told her I thought what was missing was a Defining Line. I’d never looked at it this way before now, but I think in the movies with really memorable romantic relationships have this. Not just a scene that defines the pair’s feelings for each other, but a specific, taut line withing that scene – like the point of the pin – where it is all laid bare. In each case the line perfectly defines their relationship, and the line becomes memorable exactly because it is so perfect. It’s an incredibly difficult thing to do, but if you have a romantic climax in your movie, search out that line. Polish the scene until it comes out. It’s too powerful to pass up, and may just make your good scene unforgettable.